The Philadelphia Museum of Art (PMA) knows most visitors aren’t proficient in art history. This limited knowledge of significant pieces can greatly limit a visitor’s experience with the art. Or leave them wondering why the heck a hunk of rock is in a museum. 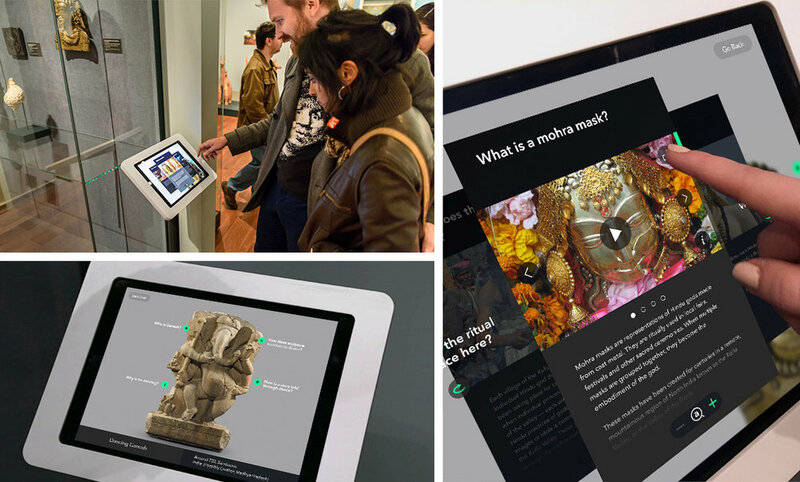 To help visitors better understand and engage with two of PMA’s most popular exhibits, my team at Allen & Gerritsen created new interactive interpretation tools. As lead copywriter on the project, I worked closely with the historians to build of a content strategy (and historically accurate narrative) that made sense for modern museum-goers. Orozco's mural masterpiece, "The Epic of American Civilization," lives at Dartmouth College and cannot be moved. Until now. We transported the mural to PMA as a centerpiece of their Mexican Modernism exhibit with a life-sized projection that synced to a custom-made app. Visitors could sit and watch the mural pan by or immerse themselves in one of the 20+ panels. My role was to identify, organize, and explain the rich symbolism embedded in Orozco’s murals — in just a few sentences. We created a series of scalable kiosks dubbed "Living Labels" for PMA’s permanent South Asian Art exhibit. Non-linear storytelling allows visitors to learn about various aspects of the artwork that most intrigue them — without limiting individual interpretation. An intuitive experience allows visitors to explore the artifacts on their own time, in their own way. All built with a system that can scale for any exhibit. I curated a series of questions that guided visitors through the most important features of the artifacts, and could easily adapt to any other piece in the exhibit.